Creating appropriate limits for children in this consumer-driven, digital age can be a challenge. We’ve come across a few resources in recent weeks that might help you navigate where to draw boundaries and provide more information from child development experts around these choices. If you have found additional resources on these topics, we’d love to hear about them in the comments! 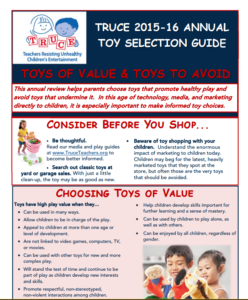 Annual TRUCE Toy Guide : This guide from TRUCE (Teachers Resisting Unhealthy Children’s Entertainment) helps parents choose toys that promote healthy play and avoid toys that undermine it. In this age of technology, media, and marketing directly to children, it is especially important to make informed toy choices. Birthdays without Pressure: From the University of Minnesota’s Department of Family Social Services, below are ideas about the following topics from parents who are working to have birthdays without pressure. These ideas have worked for others but may not be right for your family. See which ones might work for you.